Finally the wait is over for Apple fans. 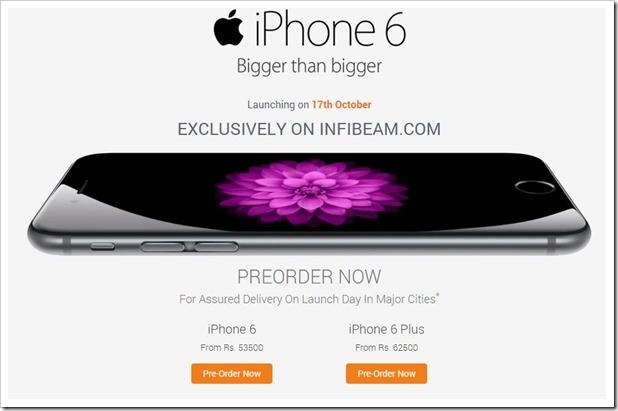 Infibeam.com, one of the leading eCommerce site in India has started taking pre-orders for iPhone 6 and iPhone 6 plus from today (7th Oct 2014). Infibeam is also sole authorized online retail partner of Apple for iPhones in India. Both versions of iPhone 6 are scheduled to launch in India from 17th October and the listing on Infibeam says that they will assuredly deliver the iPhones on launch day itself. This will ensure that people who will pre-order the phones right now will get it before anyone else in India. The 16 GB version of iPhone 6 will be available at Rs 53,500, while the 64GB version is priced at Rs 62,500. The 128GB version of the phone will sell for Rs 71,500. iPhone 6 is the traditional upgrade on iPhone 5S. It has a screen size of 4.7” and the resolution is at a respectable 1334×750. The 16GB version of Apple iPhone 6 Plus will be available at Rs 62,500/-, while the 64GB version is priced at Rs 71500/-. The 128GB version of the phone will sell for Rs 80,500/-. The iPhone 6 Plus will have ‘ 5.5-inch display sports a resolution of 1920×1080p. Interestingly, despite making the phones thinner, Apple has been able to improve the battery life for the two phones. iPhone 6+ has a distinct improvement in all departments (claiming 24 hours of 3G talk time) while iPhone 6 is more or less equal to iPhone 5S in battery. iPhones also have M8 “motion coprocessor” which will be beneficial for health apps. The camera on the two phones are still 8 MP but Apple has improved pretty much everything else about it. Now, it sports true tone flash, f/2.2 aperture, 1.5 micron pixels. Also, iPhone 6+ has optical image stabilization which should improve the photos while moving a lot. In the front camera also are some improvements and Apple has introduced burst selfies (multiple photos very quickly). The cameras can now also record videos at 1080 at 30 or 60 fps. A nifty addition has been that now iPhone users can shoot cool slow motion videos at 240 fps. So, if you have been waiting to book the iPhones, go ahead and book it now on Infibeam.com. Infebeam has miserably failed to keep its promise. I had ordered iphone on first day of preorder as they assured of delivering on 17th. today is 19th and i am still waiting. consumer service phone number hangs you for half hour and then disconnects automatically.